Our Customizable Grocery Tote features our own proprietary DigiPrint™ 2-ply laminated polyester canvas, and brilliant, high-resolution, indelible dye sublimation printing. Upload your own artwork with dazzling results. Two 1.5-inch wide poly straps provide over-the-shoulder carrying comfort and durability. This bag has the same dimensions as our tried and true cotton canvas grocery tote, making it the perfect companion for daily errands and trips to the grocery store. Each bag is printed, cut and sewn in our own factory, right here in San Francisco! 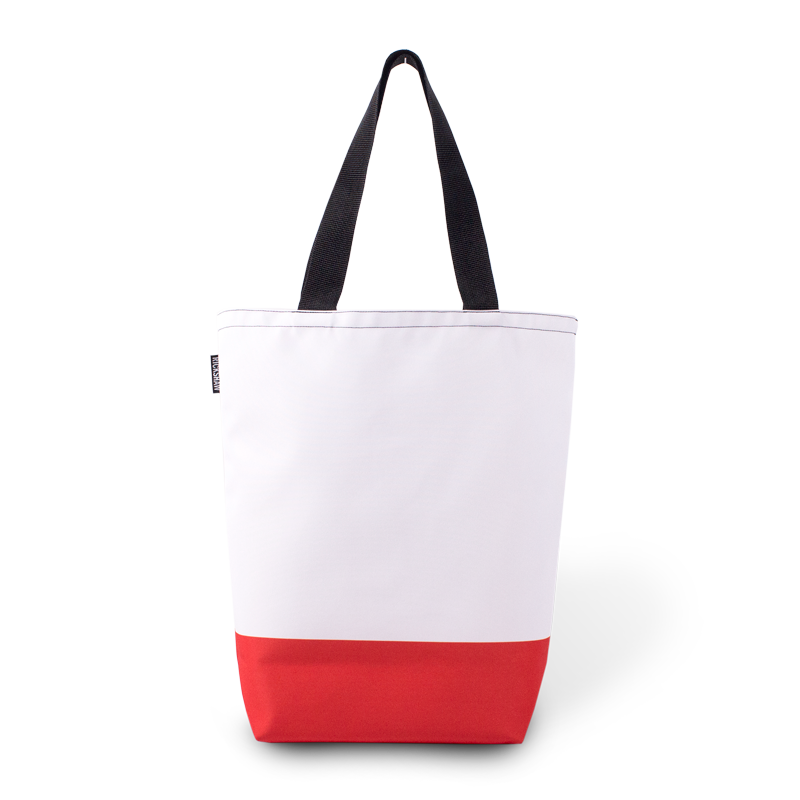 Create a custom tote to promote yourself and your business. 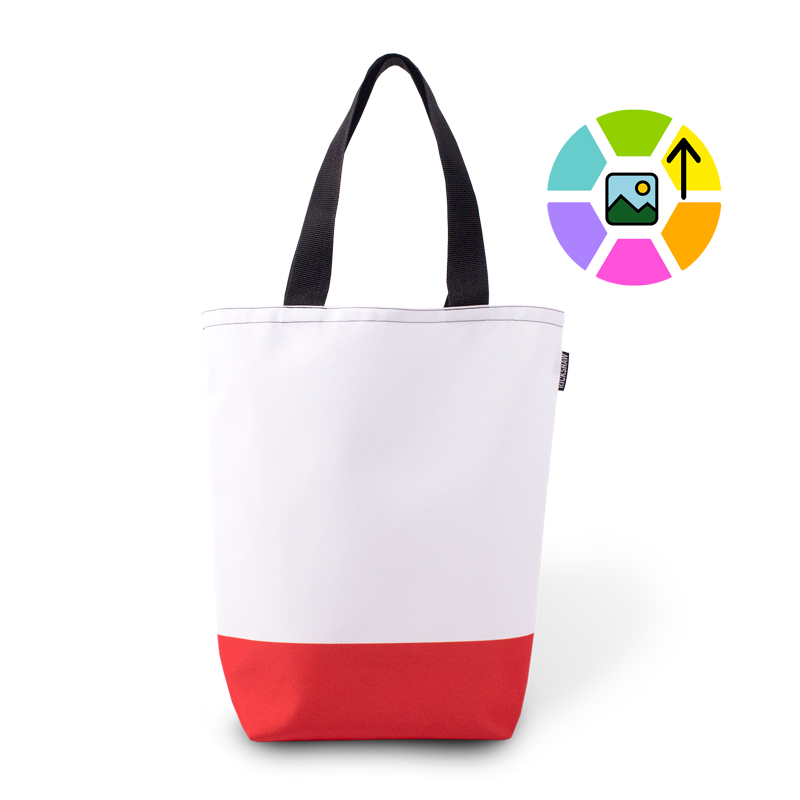 Custom totes are a great way for designers, artists and photographers to make your creative work accessible and wearable. If you have a resale license, we can set you up with a wholesale account so you can purchase custom totes at wholesale prices (50-percent discount). Unlike screen printing, there are no minimums. Buy a single bag to test your design. Buy however many you need, whenever you need them. Give them to clients, friends and family. Sell them at events. Wear them yourself! Mobile Advertising SoftWear. Need a bunch of custom bags for your business or event? We offer discounts for bulk purchases. With MyCustomTote, you can make as many different designs as you want. To learn more, send an email to sales@rickshawbags.com. If you don’t own it, we can’t print it. Please respect the rights of others. Designs submitted to MyCustomTote may not include text or images that infringe the intellectual property rights of others, including, but not limited to copyrights, trademarks and rights of privacy & publicity. As a general rule, do not use artwork or photos that do not belong to you, unless you have express written permission from the copyright holder, or they are affirmatively public domain. If it’s offensive, we won’t print it. Please, no text or images that are obscene, pornographic, violent, libelous, defamatory, discriminatory, hateful, harassing, threatening, or otherwise harmful, or represent or encourage illegal behavior. Orders that violate these guidelines, or are otherwise deemed offensive, in our sole discretion, will be cancelled and refunded.